My three-month ministry experience as a novice with the Society of the Sacred Heart is an internship at our NGO at the United Nations (UN). 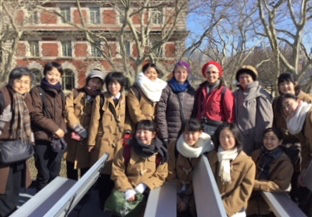 During this time, Sr. Yasuko Taguchi (JPN) and Ms. Koto Urushizaki, teacher of Japanese literature, brought nine Sacred Heart students from Sapporo to New York for a UN Study Tour. Sr. Sheila Smith (UN-NGO Representative) and I welcomed them. Sr. Gwendolyn Hoeffel (USC) was another supervisor staying with the students at their accommodation and accompanying them during the whole Study Tour. We thank her for her generous commitment and support. 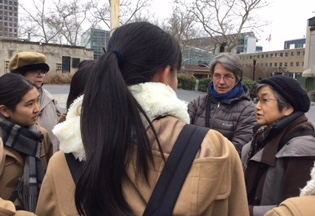 February 12-18, 2018 was the fourth time that Sacred Heart School, Sapporo, came to the UN for a Study Tour and it has been such a wonderful gift and experience for the UN-NGO office to welcome them. The UN Study Tour is part of what the Ministry of Education, Culture, Sports, Science and Technology in Japan calls the Super Global High Schools (SGH), to which Sacred Heart School, Sapporo, belongs. Since the UN-NGO office recently changed location within New York, it was the first time to receive Sapporo students in the new office. In a large conference room we had orientations, workshops, meetings and presentations. We were grateful to have two Sacred Heart Alumnae from Japan as speakers. One of them works for the UN Secretariat and the other for the Permanent Mission of Japan to the UN. Two highlights of the Study Tour for the students were a presentation by Staff at the Permanent Mission of Japan to the UN, and one at our office by a representative from UNHCR (the UN Refugee Agency). The students also visited the Convent of the Sacred Heart 91st Street where they attended classes with their host sisters, did social justice service, and spent a night at their host sister’s home. During a visit to the UN Department of Public Information (DPI), the students were commended for their preparation, follow up, attentiveness during the presentation and their keen interest in UN issues. The speaker told us that because of all these, the visit from the Sacred Heart students from Sapporo is the annual highlight for him! On our last day, we got on a ferry to Ellis Island and visited the US National Museum of Immigration. We were honored to have our former Superior General, Sr. Kathleen Conan, join us for the day. The week concluded with supper at a restaurant, where the students shared in English their reflections of the week. We were fascinated to hear them express how, through their experiences at the UN and in New York, some of their perceptions about global issues changed.